Just two years ago, when I was 17 years old, I was busy with my everyday life, and less concerned with what happened outside Norway. I took little interest is politics, ethics, or solidarity campaigns. I spent most of my time thinking about school, friends, clothes and how I would spend my free time, instead of thinking about how lucky and privileged I really am. Perhaps this attitude resonates with a lot of us among the Norwegian youth? On 24th April 2013, the Rana Plaza building collapsed. A nine-storey building that housed several textile factories where nearly 4,000 workers worked. The so-called accident is the deadliest in the history of garment production. I don’t recall taking notice of this tragedy at the time. It wasn’t until the following year – after I returned home from the production of “Sweatshop” in Cambodia and I attended a Rana Plaza anniversary street action with Future In Our Hands and the Clean Clothes Campaign – that I realized how serious and inhuman this disaster had been. At least 1,134 people died and several thousand were injured. The day before the accident garment workers discovered cracks in the walls of the Rana Plaza building. All workers in the building were evacuated from the workplace, but the next day the workers were ordered back to work due to strong time pressure on deliveries to Western brands. That day the building collapsed. The world stood still, and when people finally managed to breathe again, people had been killed and injured, and many more had been left behind – some of them orphaned. In the aftermath of the tragedy, victims and survivors suffer both mentally and financially. All those affected by the tragedy continue to wait for full and fair compensation from the brands sourcing from the Rana Plaza factories. The waiting for compensation must appear endless for victims. The compensation fund can receive voluntary contributions from anyone, including the buyers, governments, associations, and even individuals. Despite this, the horrific fact remains: the fund still has not received the full amount it needs to provide full and fair compensation to the Rana Plaza survivors and victims’s families. Some of the brands with direct links to Rana Plaza have not paid anything into the compensation fund. In February last year, I went to Cambodia with Anniken, Ludvig, a film crew and the solidarity organization Future In Our Hands. In cooperation with the newspaper Aftenposten, we created a web series, which shows the conditions in the textile industry. The result was “Sweatshop – Dead Cheap Fashion“, a series that raised awareness, provoked, influenced and engaged an incredible number of people, including young people. On this journey I got to experience and witness injustice first hand. I experienced with body and mind what it’s like to live as a garment worker, and I heard directly disturbing stories of many workers. One day during our trip, Anniken, Ludvig and I went to work in a garment factory. This was a small home business, in which the working conditions were probably far better than at the larger factories. Here we sat for 8 hours and sewed, the same seam over and over again. The day before we had spent with Sokty, one garment worker, who invited us to sleep in her house – a small room about 5 square meters. We slept on the floor. In the morning, we left directly for work without eating breakfast. 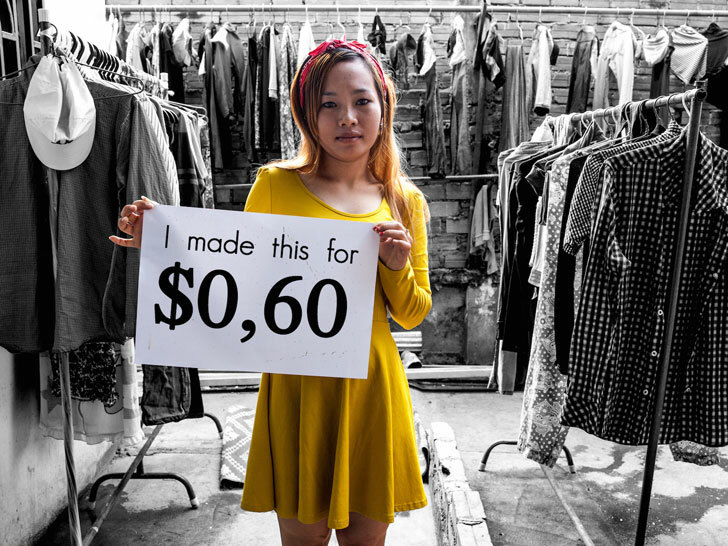 During the day I spent as a seamstress, I felt the exhaustion, hunger, tiredness and disappointment of having worked for 8 hours and only earned $3 USD. As a garment worker this is the only money I have to survive on. On $3, I need to pay for food for myself and my family. I am responsible for providing money to my parents, and paying for my house, electricity, transport, and clothes. I must also reserve some of my salary for savings in case of an emergency, like if someone in my family gets sick or needs a doctor. A few dollars a day is NOT enough!! These are people, like you, and me, and they produce the clothes we wear! Their situation should be much better! It is not human to have to go to work, be treated as a slave, and earn a pittance. 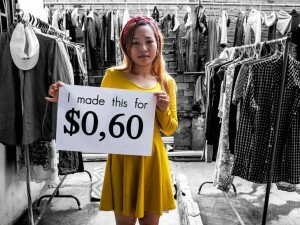 The documentary web series “Sweatshop” did help to raise awareness around the world about the terrible working conditions in the garment industry. Do we see the emergence of a revolution? Some efforts have been made to improve the textile industry, but these efforts haven’t gone far enough. There are many actors in power that need to act if we are to see any of the necessary changes happen. First and foremost, the major brands bear a huge part of the responsibility. Most brands have their production in countries such as Bangladesh, Cambodia and China. However, often times these brands refuse to share details about the factories where the production takes place, keeping secret as much information as possible. We consumers want to buy clothes from brands that seem credible and it is incredibly important that all companies disclose their supplier list. Transparency is a good thing as it helps to ensure that brands are more responsible and accountable for the factories and workers that produce their clothes. It is easy to believe that all the responsibility lies with the brands. But, in fact we all have a responsibility. While the authorities in producing countries also have a huge responsibility, we, as consumers, also hold much power. The multinational companies provide clothes to fulfill our needs, so if we all step up and say “This is not okay!” we can push the brands to change! The two-year anniversary of the Rana Plaza collapse is only days away. It is important that we continue to engage and create awareness throughout society. A fierce dedication for change is necessary. Without it, this wretched industry will continue as it has done for decades. Never before has it been as easy to spread the word about important issues like the urgent need to improve the working conditions of garment workers. Use social media! Participate in campaigns and encourage people you know to get involved. Share reports and articles. Pass on compelling photos and videos. Post Facebook messages to immoral and unethical brands, demanding that they respect garment workers human rights. We must raise our voices! We must push brands, factory owners and governments to take responsibility for garment workers human rights so that they can go to safe work places. I urge you to spread awareness about the Rana Plaza tragedy and call upon brands to contribute full and fair compensation to the victims and their families! Millions of workers around the world are working themselves half to death in unsafe factories and are starving, because we, the consumers, “need” nice and cheap clothes, while the brand owners seek maximal profit. Is this the way we want it to be? If not, let’s change it. Watch Sweatshop, the documentary web series Frida stars in, here.